I am unsure whether this post is in the correct area / forum. I have a MY2004 996 C4S and over the past few months I have been trying to source proper factory manuals et al for it. 1) PET 7.3 plus updates (342/91). 2) Bentley manual (this seems to be a pictorial version of number 4 ish). 3) 101 projects for 996. Please could someone kindly explain the bare bones of what is genuine and what isn't? The last update(s) to paper service manuals was 2006 which is when Porsche moved to everything electronic (via PIWIS). Thanks Loren. So what is the difference between Poses and the paper manuals? Also, where can I obtain updates from? Is this where TSBs come in? POSES is basically an electronic format of support literature for all models. Some files were in PDF (later updates) as they moved to PIWIS but some of the early files were in odd or image only formats. Oddly I always found a few things missing from POSES that were included in the paper manuals. Paper manuals may still have the supplements (updates) available but you would need to find out what level your current manuals are at. If the updates were done properly then the updates should be reflected in both the table of contants as well as the footers on the changed pages. In all the 996 service manual had 99 supplements - I know I bought and paid for all of them. TSBs were at one sold as a yearly subscription (about $450/year) that was updated monthly (expect that sometimes they did not ship the CDs out for 3 months). That program was also stopped when they changed over to PIWIS TSI. Now all TSBs are downloaded from PIWIS TSI on a one-by-one basis with a charge for each TSB (a real PITA). Of course of you have a leased PIWIS tester and pay the $18,000 year lease these are included with the PIWIS tester. You are better off to contact the company or person you purchased the paper manuals from and ask them what the latest update level is. Please excuse my ignorance with this. The manual I got was an electronic download. I thought it might be easy for you to check given that you said that there were 99 updates and so may have a record of what the last update was called (which I would assume is therefore reflected within the contents table as this would have been updated correctly by you!). When you say 17 volumes, is there 1 volume per repair section, I.e. Group 5 - body being one and group 3 - transmission? Some sections have more than one volume - some of the indexes are divided by pre-2001 cars and 2002 and later cars - and some indexes are divided by 2 wheel drive and 4 wheel drive. Did you try and ask the seller of illegal copy? Not all volumes may have a specific update - but in all there were 99 updates. 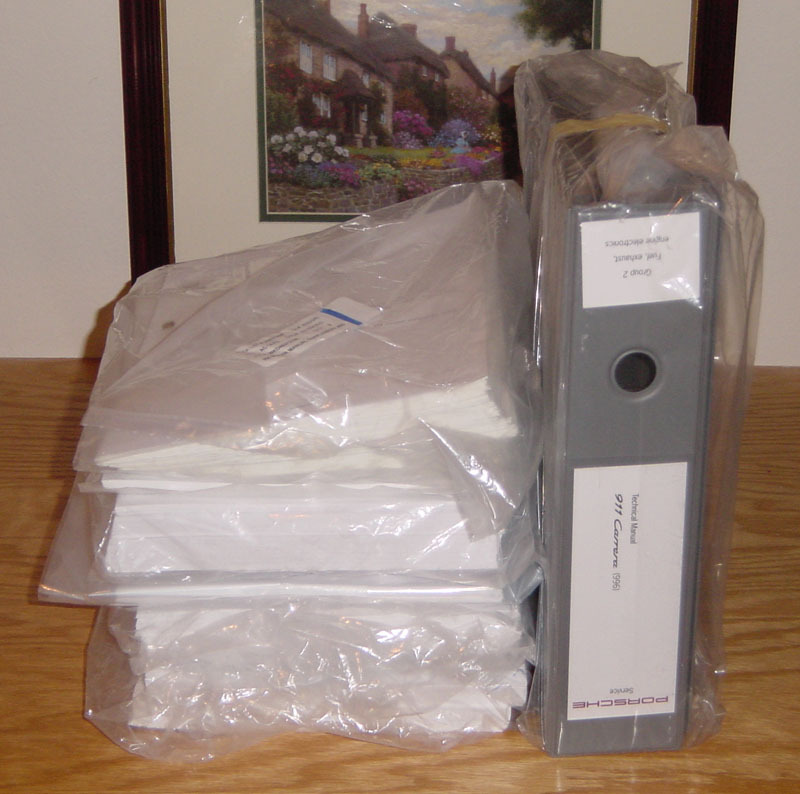 This is just one update (from 2005) that includes an additional volume (binder). Mmm, I don't think my PDFs span to that length! Illegal? I paid for it on emanuals online so assumed it would be both legitimate and comprehensive. Are electronic versions available in full for download rather than paper? Also, where is the best place to get them and how much do they cost? I have the 996 WSM with updated thru 2006 plus the OBDII manuals, Diagnostic manual, wiring diagrams up thru 2005, and other updates. PM or email me. The 996 manual you have was made in 1999 and no one else ever bothered to get the updates or remake the manual with the later versions like I did. I have the 996 WSM with the update and supplements for the 3.6L engine that you have. And Loren YES 2006 was the last POSES update. I have the POSES going back to the 72-83 911 model and the WSM are all in PDFs. Thank you for your help with this Porschelibrarian. For anyone who requires workshop manuals / POSES etc then it is best to go through Porschelibrarian - fast, efficient, and inexpensive. As you can see from my original post, I have been scratching my head for some time with this, trying to get something which up to date. I have finally succeeded. I wish I had known about this sooner! Thank you for your post. I try to keep all manuals updated and available for the members here. If anyone needs any WSM ( I admit I'm missing the 959) or PET please pm or email me. Can anyone please tell me how to contact the porsche librarian to purchase a copy of the work shop manual that is quoted in his/her 30th May 2014 post . Just send him a PM, he will respond. Thanks....I tried that but guess they are off line for the moment. I believe he travels for work and is sometimes gone two weeks. Does anyone know where I can get an engine yoke so I can fix my engine to an engine stand. I presume that a convnetional engine stand with 4 or 5 fixing points isn’t satisfactorily and that I will need the engine yoke ? Pelican Parts sell them - but the 0ne for the 996 is about $1200 US). Jeepers that’s. quite expensive !. So a traditional engine stand with 4 or 5 fixing points would not be sufficient ? You'll be fine with the traditional 4/5 arms stand as long as you spread out the load evenly and add washers between the arm and the engine case to protect the engine case. Personally I use this one. Works great!